A throwing axe is a weapon used during the Middle Ages by foot soldiers and occasionally knights. Usually, they are thrown in an overhand motion (much like throwing a baseball) in a manner that causes the axe to rotate as it travels through the air. Axe throwing is a sport in which the competitor throws an axe at a target, attempting to hit the bullseye as near as possible like that of the archery. Axe throwing is an event held in most lumberjack competitions. A skilled axe thrower will rotate the throwing axe exactly once throughout the flight so that the sharpened edge of the head will penetrate the target. Throwing axes are becoming popular among outdoor enthusiasts as a throwing tool. Throwing axes have been used since prehistoric times and were developed into the francisca by the Franks in the 3rd century AD. Although generally associated with the Franks, it was also used by other Germanic peoples of the period including the Anglo-Saxons. The francisca is characterized by its distinctly arch-shaped head, widening toward the cutting edge and terminating in a prominent point at both the upper and lower corners. The top of the head is usually either S-shaped or convex with the lower portion curving inward and forming an elbow with the short wooden haft. Sometimes the head is more up swept, forming a wider angle with the haft. Most franciscas have a round or teardrop-shaped eye designed to fit the tapered haft, similar to Viking axes. Even this New World weapon experienced some influence by the francisca in the French territories. Tomahawk throwing competitions still take place today. A hurlbat (or whirlbat, whorlbat) is the term used for a type of weapon with unclear original definition. Older reference works refer to it largely as a type of club, either held in the hand or possibly thrown. 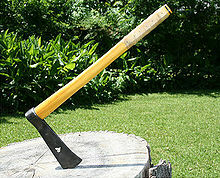 Modern usage appears to refer to a type of throwing-axe. The Nzappa zap is a weapon from the Democratic Republic of the Congo. This weapon is certainly one of the more unique-looking throwing axes. The Nzappa zaps sometimes had an iron head with two or three human faces. The handle had the shape of a club with a round upper part. The head is attached to the club via struts, giving the weapon its unique design. Besides being thrown, these axes were sometimes used to injure the enemy directly by hand. This can be used both for short distances throw and as a melee weapon in hand-to-hand combat. This page was last edited on 21 July 2018, at 22:32 (UTC).